"These assessment tools make progress in writing as transparent, concrete, and obtainable as possible and put ownership for this progress into the hands of learners, allowing students and teachers to work toward a very clear image of what good writing entails." Lucy Calkins' groundbreaking performance assessments offer instructional tools to support continuous assessment, timely feedback, and clear goals tied to learning progressions that have been aligned with world-class standards. Originally published as part of the bestselling Units of Study in Opinion/Argument, Information, and Narrative Writing, grades K-8, Writing Pathways is ideal for writing workshop, but suitable for any writing instruction context or curriculum. Annotated exemplar pieces of writing on the same topic for every grade level that highlight the traits you can expect to see at each level of the learning progressions. 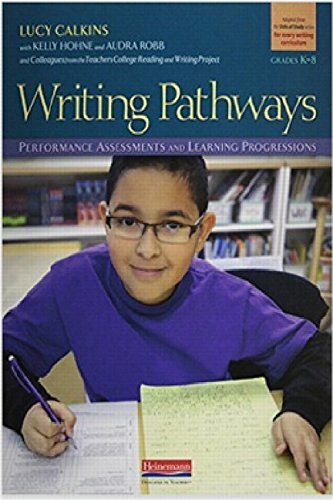 Educators who are not yet ready to implement the full Units of Study curriculum can use Writing Pathways to get started with Lucy Calkins' proven approach to writing assessment and instruction. Coaches and administrators who are supporting implementation of Lucy Calkins' Units of Study will find Writing Pathways to be an ideal resource to guide their work. Who doesn't need Writing Pathways? The content in this stand-alone edition is the same as in the previous editions found in Lucy Calkins' Units of Study (K-5 and 6-8 are combined in this new edition). Teachers who have the Units of Study do not need this new edition. View More In Education & Reference. If you have any questions about this product by Calkins Lucy, contact us by completing and submitting the form below. If you are looking for a specif part number, please include it with your message.